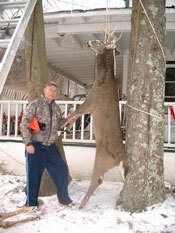 Colonial Inn Owner, Steve Witte, with his prize buck taken on state land during the 2002 Season. 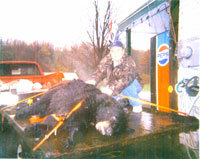 Steve Witte Jr., and his record setting Black Bear (500 lbs. +) taken during the 2003 Archery Season. 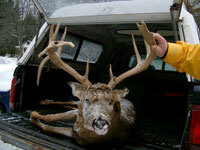 Lowell Smith, Fire Chief, Pine Hill NY took this huge rack during the 2002 Season.